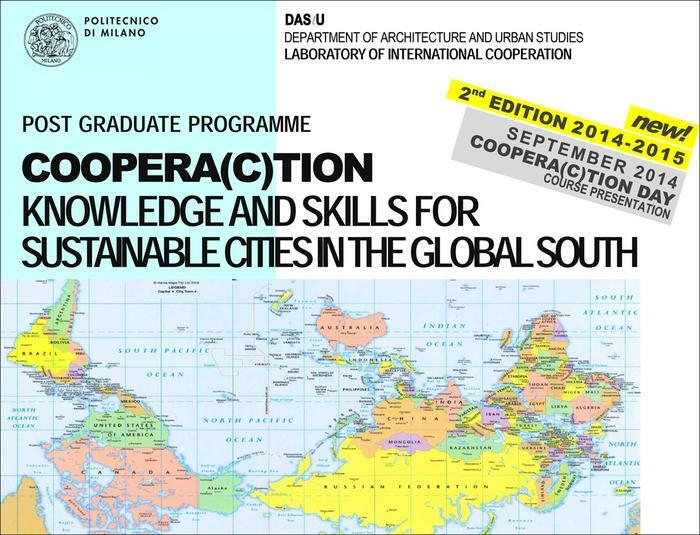 The second edition of the Post Graduate Programme COOPERA(C)TION, starting in November 2014, offers to new generation of experts the chance to acquire skills and knowledge that will help them to develop an integrated and multidisciplinary approach to planning, design and management of urban settlements and territories in contexts with a high level of social, economic, territorial, and landscape vulnerability. • The specific ability to share the search for solutions to face the challenges raised by radical socio-economic, environmental and cultural changes caused by globalisation, above all the rapid and massive urbanisation processes in Countries of the Global South, which raise dramatically new problems of spatial and social inequality, as well as a new and difficult environmental challenge related to the climate change. The reduced fee of € 1.000,00 is applicable to PhD students, and to individuals that attained a degree not before 6th of October 2013. The reduced fee of € 750,00 is applicable to the students attending an academic degrees (they should anyway have already attained at least a three years university degree). Duration: The lessons will be held once a week on Fridays (8 hours) for a total of 176 hours (22 days -approximately 7 months). Students could take part in suggested international projects or workshops also during summertime. Eligibility: Students with at least a three-year university degree, individuals with Bachelor or Master of Science in Architecture, Engineering, Urban Planning, Design, Sociology, Anthropology, Geography, Economy and other scientific fields are eligible for this Course. Language: the Course will be taught in English. If the students who enrol in the Course are more familiar with Italian, the Course can be held mainly in Italian. Students must have in any case a good knowledge of English. Credits and certificates: The Course is equal to 15 University Credits (CFU). After passing the final examination at the end of the Course students will receive a Certificate of participation.